Home / ABS-CBN / Gabby Concepcion / Kapamilya / KC Concepcion / movie / Sharon Cuneta / Star Cinema / teleserye / Sharon Cuneta-Gabby Concepcion's reunion movie in the works? 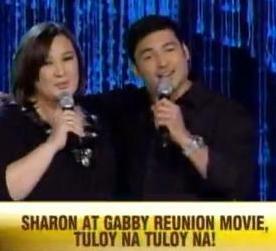 Sharon Cuneta-Gabby Concepcion's reunion movie in the works? After Gabby Concepcion returns to showbiz a couple of years ago, fans are asking for a reunion project from him and the Mega Star Sharon Cuneta. They both belong to the same home network - ABS-CBN, but the two never has a single teleserye from the Kapamilya Network together. Gabby, however, starred in two primetime top rater TV series - Iisa Pa Lamang with Claudine Barreto and Diether Ocampo and Dahil May Isang Ikaw with Ms. Lorna Tolentino, Jericho Rosales and Kristine Hermosa. Gabby also starred in a Star Cinema movie which reunited him with real life daughter KC Concepcion. Gabby and Sharon may have some things to be fixed on their personal relationship before they can do a project together. And now that the two seemed to be in good terms, how true that a reunion movie is also in the works? Well, they just confirmed that they are just waiting for a perfect script and that production may start rolling by the end of this year. Though it was not yet confirmed, we're guessing Star Cinema will have this reunion project as one of their biggest offering next year.